Important early 19th century map of Illinois. This is a good example of David H. Burr’s 1834 first edition map of Illinois. Offers color-coding at a county level and notes rivers, towns, cities, roads and renders elevation by hachure. 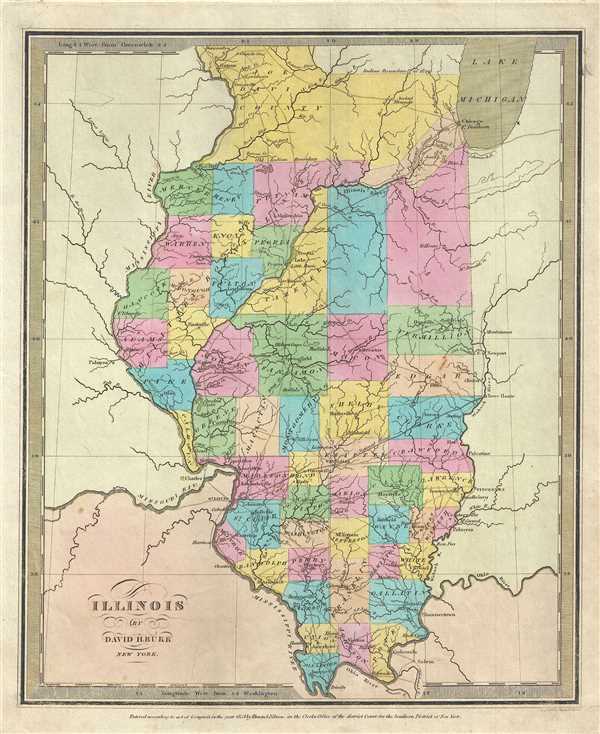 Burr’s map of Illinois is particularly interesting and important due to its portrayal of the rapidly changing American Indian situation in the northern part of the state. Within a few short years of this map's construction, most of these tribes were forcibly removed to the Indian Territory or Oklahoma. According to Ristow, although Burr is credited on the title page, he left this atlas incomplete. He was appointed as topographer to the U.S. Post Office, and of the sixty-three maps finally included in this atlas, only completed eight. The rest of the maps were then completed by Illman and Pilbrow in Burr's style. This map was ‘Entered according to act of Congress in the year 1834 by Illman and Pilbrow in the Clerk’s office of the District Court for the Southern District of New York’, but was not published until the atlas was released in 1835. Published by D. S. Stone in Burr’s New Universal Atlas. Rumsey 4628.046. Philips (Atlases) 771.